1)When are they in season? 2) From where does the Passion Fruit originate? 4)How do you eat them? 5) What is the nutritional value? 6) Will they grow anywhere? 7) How do you know when they are ripe? Passion Fruit (Passaiflora edulis) come in "waves" throughout the year with the heaviest harvest in late summer. There is usually one in January and one in spring as well. Passiflora edulis is a vine species of a scion flower that is native to Brazil,Paraguay and northeastern Argentina. Wait for them to drop off the vine to insure ripeness. Look for fruit that is slightly wrinkled.To eat fresh simply cut in half and scoop out or squeeze out into your mouth. The small black seeds are edible just crunch them down.The fruit is also an excellent topping for ice cream or cheesecake, makes great jelly or jam and the puree is often used in mixed drinks. Passion fruit is an excellent source of vitamins A and C. One passion fruit has only 16 calories. When eaten with the seeds, a serving is an excellent source of fiber. 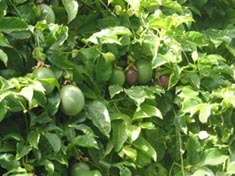 The purple passion fruit is subtropical and prefers a frost-free climate. However, there are cultivars that can take temperatures into the upper 20's (°F) without serious damage. The plant is widely grown in California as far north as San Jose, the Monterey Bay Area and the San Francisco Bay Area. The vines may lose some of their leaves in cool winters. The roots often re sprout even if the top is killed. The plant does not grow well in intense summer heat. The yellow passion fruit is tropical or near-tropical and is much more intolerant of frost. Both forms need protection from the wind. Generally, annual rainfall should be at least 35 inches. Passion fruit vines make good container specimens but require maintenance. They perform well indoors. When ripe, it has wrinkled, dimpled, deep purple skin. Skin is old-looking, but does not mean the fruit is rotten. Mold does not affect quality and can be wiped off. Fruit color is green when they are immature, changing to shades of purple, red or yellow as they ripen. Leave at room temperature to ripen. The skin will wrinkle, but the fruit will not soften much. Once ripe, store in the refrigerator up to 1 week.